That looks like a decent Monster Hojo. If it were to be released, I'd definitely play the game with him in it just as soon as I've finished KH2.5, Deus Ex Revision, and VTMB Mega-Mod. Thanks for all mods. They are amazing! Hello! Great mods but I have a small request, if possible. Could you make a beard-less Cid model for world/field/battle? He looks awesome with the beard but it's a little odd when a cutscene plays and you suddenly see him without a beard. If not, that's fine. Well, Photobucket no longer allows free image hosting lol, and there's no way I'm paying $300 to upgrade. Guess I'll have to eventually update my images to imgur, super. I'll update this sometime in the near future. I like everything except the sound I can hear compression artefacts which were not present in the original FMV, why on earth did SE downgrade the sound? Also what do you mean by full screen? I hope you dont mean stretched out to widescreen so everyone looks fat. The audio was stripped from the 2011 videos, and I touched up the original 98 audio for these. It seemed to come out pretty well overall, unless you're an audiophile and are able to distinguish artifacts in the sound. I cant speak to much as to the technical details though, I did that mod in 2013. For the "full screen" option it is stretched out. Cropping the image yielded even worse results, but since I knew not everyone would prefer them there's also the standard version available. My release thread has been restored since the photobucket hosting issue, and more importantly Johnny Bravo is once again overlooking Qhimm forums. How do I use the standard version with 7th heaven, there seems no option for it in the options. If you click on Configure, and then Ending Video Resolution in the options window, there should be a drop down option to select the standard version, with a preview image. I have v 1.54 and is no such option. If I click configure, I can choose between a few different FMV's yours is only listed once as a single package, no sub options for it. So no ending video resolution option. I have no idea what v 1.54 is. I'm a bit out of the loop of the goings on here at Qhimm. That's not something of mine, that sounds like a Qhimm 7H catalog mod. My guess is that it's managed by EQ2Alyza. If there's no selectable option, I'd assume she went with the default video choices, so the standard one was used. It's even the image used in the preview. v1.54 of 7th heaven. You said in 7th heaven you could select it, so I am confused now. But I will make the request to her to see if she can repackage it. I dont know what you meant by selecting the option tho. Where did you download this mod from? Unless you downloaded my 7H version from my page and manually imported it into your library, otherwise I don't know what you have installed. The mod in your 7H window I assume is the Media - Movies one? This looks like something you installed from the Qhimm 7H tutorial thread (this one I assume: http://forums.qhimm.com/index.php?topic=15520.0) that's a compilation of everything that's released on the forum for you to pick and choose from. I haven't looked at the Qhimm 7H catalog in about two years so I don't know what's in it. I can only really help with install issues of things downloaded from my page, or in game issues with one of the mods, though support will be dependent on severity since the last thing I released was in 2015, and no issues have really been mentioned at this point. I got it from the catalog on 7th heaven. I will try your download link, I think I understand you now, I am sorry for misunderstanding you. I believe you telling me if I download your 7th heaven package then that option will show up right? I got it from the catalog supplied on the 7th heaven thread, which you dont maintain, so this is where the confusion has come from. Yes, I sometimes take out options because the file size for downloading in the Catalog gets too big. If I were to list every mod individually in the Catalog, the scroll bar would go on forever and new users wouldn't know where to begin. Compatibility would be a huge issue also. If I were to group every mod into their respective categories, the file sizes would be too large for those with limited internet bandwidth. So, I do it this way but sometimes cut a few options to reduce the file size. I don't really know of any middle ground to doing this. Not a problem Alyza, perfectly reasonable configuration for the catalog. You've done a great job organizing this as a successor to the massive bootleg torrent. I agree, I don't think there's a better way to organize things for an automated installation method for users, that also doesn't greatly increase download and storage sizes. I think the only issue here was just figuring out I was trying to answer questions for a different 7H mod lol. I'm a bit out of things lately, so I had no idea what "v1.54" meant lol. Oh lol, I thought that maybe the version number of the catalog or something. I've been so busy with work and school I haven't modded anything in about two years or so. No real idea what the current state of the modding community here looks like lol. Looks like a lot of new recent activity. Perhaps a beginner and expert mod, with beginner been the default? Beginner how it is now, expert would show the extra potentially confusing mods. I think on an overall basis 7th heaven is good, before using it I was scared the amount of work texture overhauls required, and this simplifies it massively, for me the only real issues have been the exe problems I posted about and this FMV issue, but this FMV issue has a solution which I now know about. cmh175, by the way these FMV's are really good quality compared to the originals visually, it is a massive difference. I have added hext support in the next release, which rids any use of extra exes. 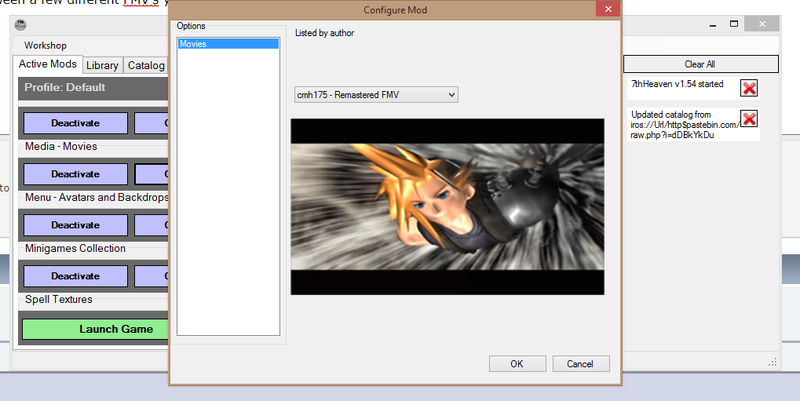 I'll need someone to check over and possibly edit any issues with stat changes, but it should be much easier to do than the current way of switching assigned exes in Workshop - > Settings - > FF7 Exe. sounds good, and sorry cmh175 for this 7th heaven discussion been in your thread.